Editors Note: Today we welcome the very talented Amanda Formaro of Crafts by Amanda as a guest blogger to the iLoveToCreate blog! Amanda is wildly talented and her knack for kid's crafts will blow your mind! She also brings her talents to baking, painting, and décor, and is a social media maven! Read more about Amanda at the end of this post! 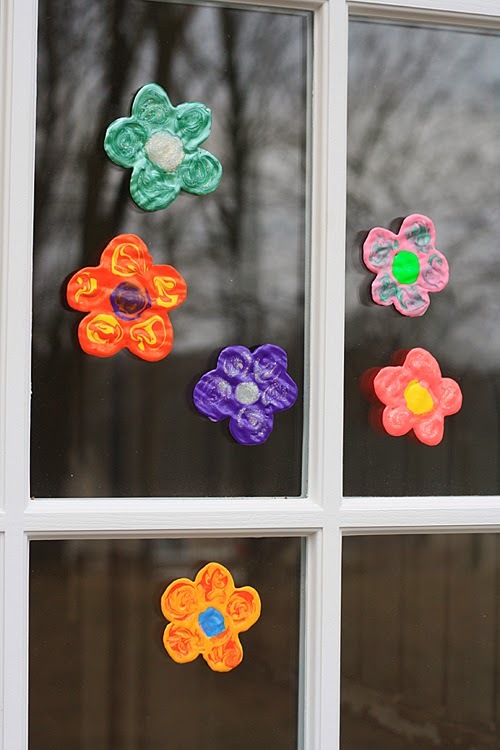 Making your own window clings is a fun project for kids and a great way to celebrate the colors of spring. Don't be surprised if your kids want to make more window clings once they see how cool they turn out! Scribbles 3D paints if you happen to have them on hand. My favorite? The iridescent, so shiny! 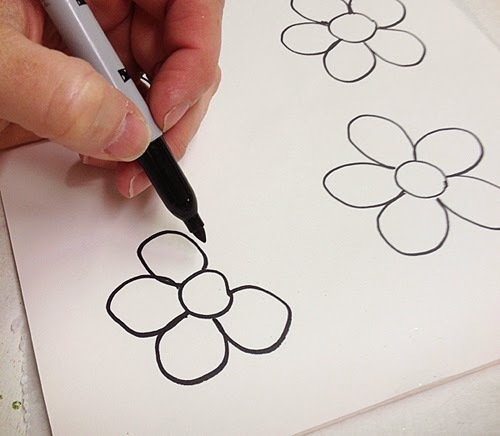 Use black marker to draw simple flower shapes onto a piece of white paper. Place the drawing onto a piece of foam core board (a cork board works great too) and lay the parchment paper over the top. Use pushpins to secure everything in place. Use the different color Scribbles to color in your flowers. Add a dot of a contrasting color to the base color. Use a toothpick to swirl the colors, being careful not work it too much or they will just blend together. Set everything aside to dry for 6-8 hours, though overnight is best. When completely dry, remove the pushpins and lift the parchment off the foam board. Carefully lift the edge of a flower from the parchment and peel the flower off the parchment. Press onto a window or mirror to display. Note: If your windows are cold, it will be harder for your window clings to grab and they may not stick at all. In that case, use your window clings on a mirror or picture frame glass until the weather warms up. 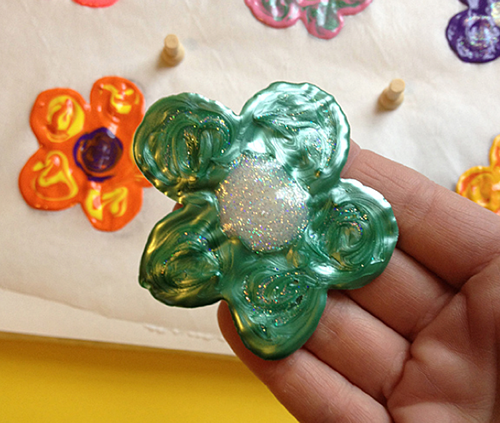 This is a fun project for all ages and a great rainy day craft for the little ones to enjoy! Amanda Formaro is the crafty, entrepreneurial mother of four. She has been working online and from home since 1997. A former webmaster turned blogger, she is a crafting expert and has appeared online and in print publications many times over the years. Her passion for crafting resonates from her blog, Crafts by Amanda, where she shares tutorials with step-by-step photos for adults and kids alike. Also find her on Facebook, Pinterest, and Twitter. Que guapas cosas haces combinado colores y formas,un saludo cordial Amanda.